Using Pareto’s Law will ensure that you eliminate things that are ineffective and gain more time by doing only what’s most effective. You reduce your anger and increase your happiness. Pareto’s Law was invented by economist Vilfredo Pareto. It says that 80% of wealth and income is produced and possessed by 20% of the population. More importantly, this law can be applied in almost every area of life. It can be formulated as 80% of consequences flow from 20% of causes. For example, 80% of results come from 20% of effort and time. Apply Pareto’s Law to productivity. 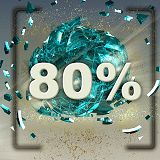 Which 20% of your tasks will produce 80% of the results? To make it easier, imagine that you have a heart attack and can work only two hours daily, no more. What would you do? Improve your happiness using Pareto’s Law. Which 20% of sources are causing 80% of your problems and unhappiness? Who are the 20% of people who produce 80% of your enjoyment? Apply Pareto’s Law to your professional life. Which 20% of advertising is generating 80% of the revenue?